This is the next generation of our app iAmBeatBox, which has been #1 in Free Music apps in more than 30 countries, with over half a million downloads in it’s first month. MacDevForum called iAmBeatBox “Super Stylish, Simple, and Striking.” Now we’ve taken this to a whole new level. 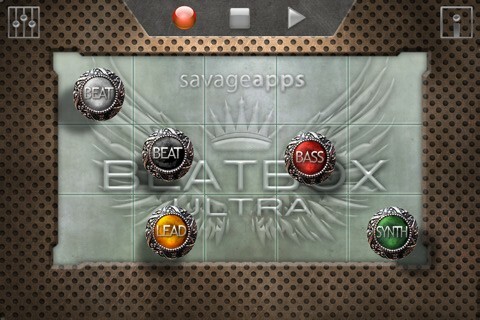 In BeatBox Ultra, you now have five gems, giving you ultimate control of the music. –The first gem works the same as in the free version. So all those hours of training wont go to waste. –The second gem controls a whole new set of beatbox tracks. Now you have two unique beats to explore and enjoy. –The third gem controls lead instruments ranging from classical to the exotic. –The fourth gem controls a wide assortment of bass tracks. –The fifth gem controls synth tracks, bringing a solid electronic presence to your mix. BeatBox Ultra is easy to play and master, and has endless combinations. The music is specially designed to sound great no matter what groove you’re going for. And thanks to the brilliant people of DanceMidiSamples.com for allowing us to feature their BeatBox Loop Package called “DMS Acapellas Volume 2: BeatBox” which are samples of beatbox artist Bass6. If you love the loops, go to dancemidisamples.com and buy them for yourself. We’ll soon be releasing a series of music apps that feature various packages of DMS loops. As for BeatBox Ultra, we created our backing loops with both Logic and GarageBand. Feeling creative? Check out all that these powerful music tools have to offer! Lastly, this is a hefty download. We didn’t skimp on the music quality. It’s uncompressed, CD quality audio, and you are in complete control of it all! This is part of our iAmSuite of interactive music apps. Look for other titles–including BeatBox Ultra for iPad, which has another row to mix with, giving you 25 more tracks in your hands.